ورقة من 10 × 1 أوقية 1997 عملات فضية لورقة القيقب الكندية الأصلية مختومة فليكس Diversify your portfolio with a sheet of 10×1 oz Silver Maple Leaf Flex Sealed silver coins at the lowest price today! The Canadian Maple series remains as one of the most popular bullion coins minted by the Royal Canadian Mint. Issued every year since 1988 the 1997 rendition of the Canadian Maple is the historicly lowest minted year consisting of only 100,970 coins. The obverse of this coin displays the quintessential emblem of Canada; The Maple leaf. 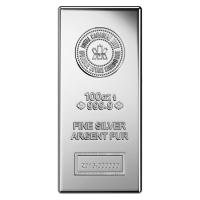 The country of origin is displayed proudly over the symbol with its 9999 silver purity on each side in both french and English and its weight on the bottom. The reverse of this round illustrates the likeness of Queen Elizabeth II in addition to its five dollar face value, and the year of issue. 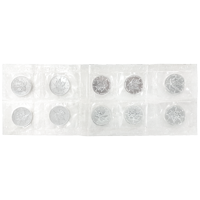 This order comes in a flex-sealed pack of 10 coins, as issued by the Royal Canadian Mint. The purity and rarity of this coin appeals to both investors and collectors alike. Stack your wealth in ounces with this rare and original flex sealed Maple Leaf silver coin today!